I tried to respond to a question on the CCM list and failed for technical reasons which are beyond me, so I thought I would address it here: by all means transfer it to the CCM list if that seems appropriate. Elizabeth Foss asked, why do some of our homeschooled teenagers and adults do really well, and embrace our faith and lifestyle, while others rebell? What makes the difference? What can we do to ensure a good outcome? The word that immediately popped into my head was, attachment. I think it is key. Having adopted my children, I am aware of the subject of attachment issues through adoption resources. I think attachment issues are becoming really common among children in general, however, though obviously adopted children are at increased risk for this. There are things one can do to increase the likelihood that our children will embrace good Catholic values. Keeping them close when they are little, practising attachment parenting, homeschooling, maintaining appropriate limits, inculcating a love of the faith through both educationa and example, restricting the use of electronic means of entertainment, fasting and prayer, etc. Ultimately, though, as the children move towards their late teens, they will have to make their own choices. They will choose what they love. 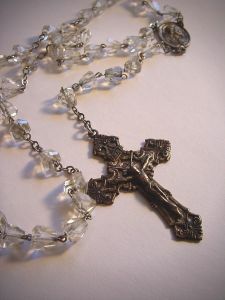 Those that have remained close to us will love what we love: their glorious Catholic faith and all that goes with it. Those that have been seduced via their peers by worldly values may love those things more and reject their faith, and to some extent their families too. So, how will we ensure the younger three (ages 9, 4 and 1) will emulate our ds 23 and dd 16 and remain close to us? We will remain very sensitive to their attachment needs. My little boy still wants to sleep with me cuddled up. He is four. There are PLENTY of people who would find this odd. I don't care. His birth mother had a difficult pregnancy and delivery. She smoked heavily throughout, periodically stifling him. He was born two weeks late of normal length weighing barely six pounds and was painfuly thin. He was so delicate as a baby that we had him baptised at three weeks in the only Catholic church in Seattle that would help us: the eastern rite church. As far as I am concerned he will decide for himself where he sleeps and no-one will convince me otherwise. While we will do outside activities that benefit the children, I have lost any doubts about "socialisation" that I ever had. They will do what I judge to be beneficial, as long as they enjoy it. The first sign of any discomfort, or any peer group influence of an unpleasant nature, and we will stop it forthwith. I am going to trust my instincts on this one, as they have always been right. We do know our own children. It is better to have no outside activities with other kids than the wrong ones, believe me. The computer has to be watched simply because a child roaming free on the internet is as safe as that same child wandering the streets at night. Elizabeth mentioned two mothers whose daughters posted scantily clad pictures of themselves on My Space. Once my (handsome) son had been to just ONE teen retreat, he regularly received a ton of pictures from teenage girls almost literally trying to sell themselves to him by emailing him s*xually explicit messages and at times very provocative pictures. These were girls from "good" Catholic homes, whose parents had no idea what they were up to on the computer. None of our husbands had to contend with that. It is very hard for a normal young male to maintain purity in those circumstances. Well, I could go on. The key though is to watch attachment. Do your children, including teenagers, basically want to please you? Are they warm towards you? Do they respect what you say, even while exploring other points of view? Do they love the faith that you love, that is the cornerstone of your life? If the answer is "no" or "not really" or "only sometimes" then alarm bells should ring. Pull them back from outside activities and play dates and the computer and any outside influences that are competing with the family. Once pulled back in, let them know how very much they are loved (not easy if they are being very difficult, but possible). It is no accident that the pull away from us often or even usually involves s*xual misconduct of some kind, as this is a favourite device of the devil, being a direct mockery of the Incarnation. Prayer through Mary is therefore particularly necessary. The best thing of all for attachment is homeschooling: I have been so confirmed in this. I think there are implications for attachment in the kinds of educational approaches we use, but that is another post! Enough for now: I will be so interested in others' responses. That is a very thought provoking post. My brain is literally mush (and I am at the moment hiding from the children I am supposed to be attached to! ), but I will try to add to it. At this point I am only dealing with one teen, so my experience is limited. I do come from a family of seven. I am the sixth. The oldest four rebelled horribly from a pretty young age and have never really recovered. the next brother was an easy-going guy who crossed the line a few times but in all was the "golden child" as the others call him. I followed the example of the rebels and lived a miserable, sinful existence through my late teens until I had Charlie out of wedlock at 21. My younger brother dedicated his childhood to swimming and was definitely the baby of the family and very attached. He is still floating around doing his own thing at 30, but he never went off the deep end and has a respect for what he was taught. He will probably become a great dad and Catholic when he decides to settle down. So what went wrong with the older four? My dad was never home, and when he was he was often drunk or just plain mean. There was no attachment. My mother avoids conflict and tended to enable or ignore behavior rather than face it. My dad had stopped drinking by the time the three of us younger kids became aware of our surroundings, I never remember him drunk. It still took years for him to chill out though. One thing I have heard repeatedly is that our relationship with our earthly father profoundly impacts our relationship with God. In trying to analyse successful families with teens that I know it seems to come down to the father and his relationship with the kids. Especially important, I think, is that the kids see the father praying. As moms, our job is primary when they are little, but as they start to mature the dads become so important. I can point to all the mistakes I made with Charlie as factors. He was in daycare from 10 months old. I worked in the same daycare, but it was still a mistake. He did not nurse for an extended time and I spent years trying to get him to sleep through the night. It never occured to me that he could sleep with me. I married my husband when Charlie was almost four and they had a very rocky relationship for years. They are both choleric and strong-willed, so neither was willing to give up their "power". Charlie still resents the harsh discipline (we were big Dobson fans), especially when he sees that his siblings are treated differently. We have tried to explain that this is not an issue of biology, rather maturity. Just like other parents we had to learn from our mistakes and re-adjust our approach. Unfortunately, there will always be that thought in Charlie's mind that he was treated differently because he was less loved. But as a good friend said to me, they all need their "issues". Charlie has an obvious choice for an issue, but if it wasn't that then it would be something else! Better stop hiding now, they have found me anyway! I hope some of this makes sense. I read a really good book on the subject of peer relationships and attachemnts, etc. I don't usually read books like this, but I read this one and have recommended it to others, too. It is called Hold on to Your Kids: Why Parents Need to Matter More Than Peers. It is the kind of book where you will suddenly say, "listen to this" and start reading out loud to who ever is in the room. I did have a fellow hsing mother approach me this past Friday at co-op and ask me about my teens. I told her I really don't know what we've done right. I really don't know. It's by the grace of God. It really is. While my teens may fall, so far I have seen them get back up and the Crucifix remains their focus. They may not always be saintly, but I know what's in their heart...and it's good. I know that I have always been there for my dc. I know that their father and I have given them endless love, endless advice, endless discipline, and endless hours of communication. Most parents would say they have done the exact same thing. That is what parents do . I also know families where the children didn't give them any problems until they were in their 20's and were influenced by in-laws. So you can't ever tell. We have to secure the foundation and hope that our child's structure (that he builds himself and with the help of outside influences) withstands the storm. I always come back to St John Bosco - today ( January 31) is his Feast Day. I have often tried to ponder why some teens rebel - and why we haven't (yet? ) had this issue. I don't have the answers but I do know that St John Bosco has been a true role model for me as a parent and as an educator. And a great Saint to ask for intercession as we live and learn with teens and young adults. More St John Bosco quotes that I find helpful. And I hope they add something to the thread. My sons, in my long experience very often I had to be convinced of this great truth. It is easier to become angry than to restrain oneself, and to threaten a boy than to persuade him. Yes, indeed, it is more fitting to be persistent in punishing our own impatience and pride than to correct the boys. We must be firm but kind, and be patient with them. See that no one finds you motivated by impetuosity or willfulness. It is difficult to keep calm when administering punishment, but this must be done if we are to keep ourselves from showing off our authority or spilling out our anger. Let us regard those boys over whom we have some authority as our own sons. Let us place ourselves in their service. Let us be ashamed to assume an attitude of superiority. Let us not rule over them except for the purpose of serving them better. This was the method that Jesus used with the apostles. He put up with their ignorance and roughness and even their infidelity. He treated sinners with a kindness and affection that caused some to be shocked, others to be scandalized and still others to hope for God's mercy. And so he bade us to be gentle and humble of heart. I've shared these links before but I know how links get lost. One of the Franciscans of the Immaculate, who has a charism in instructing parents with their children began a class with an interesting analogy. He began by talking about the gravitational pull of the earth and the force that it exerts on the moon. The earth, by its mass and speed of rotation, keeps the moon in its orbit. The only way the moon would be taken out of the orbit, is if a stronger and greater object pulled upon it. (Something like this.) If the main body gets knocked off its axis, spins awkwardly, the satellite, the moon, feels the effects more. The point he was trying to make, (I don't know if I am actually getting it across) the tighter the parents spiral of virtue, the less effects are felt by the children. The more wobbly and slowly spinning the main planet, the less effect it has on the satellite. I think St. John Bosco totally bears this idea out. How did he succeed in leading 2,500 wayward boys to the priesthood? Unwavering, unmitigated, personal pursuit of holiness. How else could he have lead these boys without severe punishments? By practicing the Divine love of a saint. The little I have read of St. Edith Stein also bears out the truth of what Jane, in the first post of this thread said. St. Benedicta of the Cross refers often to the human person as being soul, body and psyche. One cannot overlook the importance of attachment and good mothering, and good fathering. But, this leads again, in doing your best, living your vocation as a saint. Thanks for the extra links, Cay. I've been thinking about this topic a lot lately. I've been thinking about it in retrospect...how did my first family manage to make it through incredibly difficult times (alcoholism, terrible public schooling, superficial church understanding, tough hometown, both parents working, on and on...) yet today we are united with our eyes looking toward heaven. My first thought is GRACE!!! Plus, I have my first teen coming up the ranks. I'm reliving my own teen years through her (which started prematurely for me at age 11 when so much started to go downhill.) It downright hurts. This anthology is broken down into the four basic categories of spiritual journeys, according to the editors. 1) Wanderers and seekers--those who pursue "all available experiences under the sun." 2) Pilgrims and missionaries--"individuals whose life goal has been the unwavering pursuit of God." 3) Mystics and visionaries--"who focus on supernatural experiences and epiphanies." 4) Philosophers and scholars--those who "demonstrate a lifelong commitment to the discernment of the truth through the exercise of the intellect." Through my little blog, I'll be exploring this question for some time...fascinating topic. 1. In the future, I will never again take part in any public performances at market fairs. I will never go to dances or theaters, and, as far as possible, I will not attend the dinners which are held on such occasions. 2. I will not do any more juggling, acrobatics, or tight-rope walking; I will not play the violin; I will not go hunting; because all these things are absolutely opposed to the ecclesiastical spirit. 3. I will love and practice solitude, and temperance in food and drink; and I will not take any more sleep than is strictly necessary for my health. 4. Whereas in the past I have served the world by reading secular literature, in the future I will serve God by reading only about subjects relating to religion. 5. I will combat with all my strength everything, every reading every thought, word, and action contrary to the virtue of chastity. In counteraction, I will practice all those things, even the least, that can contribute to the preservation of this virtue. 6. Besides all the usual practices of piety, I will never omit a short mediation and spiritual reading each day. Does anyone know if St. John Bosco kept this 2nd promise? If so, I must confess that I am a bit disappointed. I had always thought he was a juggling priest. Maybe he was simply a priest who was a former juggler? I guess I am a bit shocked because I always saw him as a saint in the same spirit as JPII. But his attitude here is so different than that of Pope John Paul II, who obviously believed that fun activities like kayaking and skiing are not at all opposed to the ecclesiastical spirit. Yes, he kept these resolutions. St. John Bosco brought his resolutions to the Blessed Virgin Mary and begged her that he would keep them. St. John used these tricks while he was a youth. When he was a teenager, he noticed children gathering around the church on Sundays, but not attending Mass. He would organize a show for them, the price would be the Rosary. He would retell the homily from Mass verbatim. As his spirituality deepened, he resolved to never cast scandal upon the holy priesthood. Even the thought of possibly causing scandal, occasion of sin to others, made him resolve to give these up. This is an example of heroic sanctity. Anything we resolve to give up, even if it seems minor, will be richly rewarded by God, who is greatly "injured" by sin. St. John Bosco totally understood this. For the boys in the oratory, St. John made their shoes, mended their clothes, during the night he wrote their text books. He went begging for them, finding them jobs, apprenticeships. He taught them, heard their confessions (he could read their souls), said Mass for them. He would have 500 boys at a time. He didn't sleep or at least rarely. He would take two boys with him on a "begging" mission. He would choose two boys who knew the way to the wealthy person's home. Resting his hands on a shoulder of each boy, he would "sleep" on the way! He didn't need the tricks when he became a seminarian and a priest. He had become so transformed into the Heart of Christ that Divine Love spoke through him. The boys followed him like lambs. Wow! Thanks Helen! Now I'm off to meditate on these resolutions for a while. Anybody want to try to look at them through the lens of a 21st century wife and mother? What do they mean for us, particulary with regard to raisng holy children? The sense I'm getting, reading these comments, and the few on CCM, is that there is absolutely a connection bewtween holy children and attachment parenting, constant dialogue, and living a sincerely genuine holy life as a parent. I'm thinking about these things and Alice's thread on being a social misfit and then the thread on peer groups (both for ourselves and for our children). We are really being reminded on these boards lately that we truly cannont be of the world. How much can we really be in the world? Then, I keep hearing St. Therese saying "Be Little, Be Little!" I've been up since 2AM. Anyobdy who has slept want to see if they can make sense of all this? However, the little way of Saint Therese seems much more doable. Now that is not because it is easy: obviously it isn't. She too had heroic sanctity. But the thought that my path is to greet each misdemeanour or disappointment, one by one, with as much calmness and love as I can muster, simply picking myself up and starting again if I fail and trusting in God's mercy to bless each pathetic effort I make, fills me with hope, while a promise to myself NEVER to show anger again would stoke the fires of my wretched perfectionism and leave me vulnerable to feelings of hopelessness next time my son does or says something bad. That sort of hopelessness would feed my anger actually, as I would be tempted to throw up my hands in despair. Saint Therese wanted only to be a little saint, but ended up a great one. There is so much paradox and mystery there, but I do think her emphasis on God's goodness and our own childlike dependence on His grace is the right one for our terrible times. I'm interested in others' responses. This author wrote a very good article over at Catholic Exchange. She even mentions the inevitable laundry . I think it's times like these that stay rooted in our child's soul. She gave her boys her time, her sense of humor, her love. Even if her boys do go astray for awhile, I'll bet they'll return to the fold just fine. I have found that saying a daily rosary with this St. Therese CD to be very helpful in striving for that sanctity we need to be good parents. There is a meditation from the Little Flower's writing for each and every Hail Mary. For me, this is really excellent because I have a difficult time focusing on meditating on the same thing for an entire decade . This CD has you meditate on one virtue per mystery but it gives you a different thought for each Hail Mary. The Luminious Mysteries are included. world..........are you (as a teen) prepared to defend yourself? See I think one undeniable aspect of this is that teens naturally feel they are invincible. Didn't most of us? How many of us appreciated our parents' offer to tell us how to live our lives? They aren't going looking for trouble most of them. They want the adventure, the fun, and have this unshakable belief that they have it all under control. Those of us who have spent enough years with lots and lots of children have long since given up that illusion lol! But young people go into the world with confidence in their spiritual, physical, and emotional strength. Unrealistic confidence often. Absolutely. The cold hard truth is we cant prevent this completely. God didnt and we can't either. I have another thought brewing in my head too. My evangelical friend and I were discussing the whole issue of outward behavior vs inward convictions. I think the outwardly rebellious kids may in many ways be more honest than some of their more obedient looking peers. Its a rare child who doesnt have to test his parents' faith and make it his own at some point. For some that is a smooth transition, for others less so. I am not convinced we can always know which of our kids has made that transition either. Some who appear to be most compliant are stewing inside and others who are most vocal could be on the brink of greatness. God is the only one who can read their hearts. To me, this is what is meant by the scripture we are saved by childbirth. Its not the physical act of birthing but what children demand of us as we raise them, how we are brought to our knees over and over humbly admitting this is beyond our contol and offering all the trials and challenges to the Lord. Its an Abraham thing. He gives us these children but ultimately they are His and we do so much better when we recognize that and offer them back to Him. He offered His own children free will and we have taken Him up on that. It hasnt always been pretty, but the loving kindness of our Father and Blessed Mother are irresistable to most of us. Hopefully that same firm but gentle, unshakable love will be what compels our own children to share our faith and walk that walk. All in all this is a daunting, formidible task - parenting. Jane, perhaps you and others with children with disabilities could chime in here. I think that has made this a bit less wrenching for me. I long ago gave up the illusion that I could program my life or theirs and just committed it all to prayer. What else could I do? I wonder if this is harder for families who are able to hang on to that illusion longer?